Cheerson cx-10, The Full Quadcopter Review For Beginners! Looking for the best RC drone for kids and beginner flyers? If so, then the Cheerson CX-10 is something worth getting. The main reason why this quadcopter is ideal for such users is that it is small enough and most especially, it can be flown indoors. However, regardless of its small size, this device has sufficient power to handle outside situations. The CX-10 quadcopter is highly responsive and extremely fun to fly. The Cheerson CX-10 is also easy to operate and considered one of the coolest quadcopters out there. You are going to be surprised how well this quadcopter works and performs. However, if you are new to flying such devices, it is best for you to hone your flying skills with the help of CX-10 until you are skilled enough to operate a more expensive model such as the DJI Phantom 3. Either way, if you’re interested to know more about the Cheerson CX-10, then you have come to the right place. In this Cheerson CX-10 review, we will show you everything that you need to know about this excellent beginner and most especially affordable drone. So, without further ado, let’s start reviewing the Cheerson CX-10. Let us take a look of what CX-10 has to offer. 1. It is constructed with a six-axis gyroscope stabilization that offers stable flight as well as great flexibility. 2. CX-10 comes with three-speed modes (beginner, intermediate, and advanced). 3. It’s an RTF (Ready-to-Fly) drone. 4. Belong to the nano size group. 8. It can perform flips in just a press of a button. 11. Constructed with a 2.4GHx remote control (wireless) with a decent range. 13. Its transmitter utilizes two triple-A batteries. However, the batteries aren’t included in the box. 14. The CX-10 features a low current alarm. The CX-10 quadcopter is manufactured by Cheerson, a Chinese company that is known as one of the top manufacturers for hobby quadcopters. The manufacturer of this drone has gained an excellent reputation for its very affordable yet high-quality hobby drones. With that said, you are sure that the Cheerson CX-10 will not disappoint you and it is an excellent value for the money. On the other hand, this device is a good starter drone and considered one of the most affordable on the market these days. Even so, if you're a beginner flyer, you can surely fly this small quad freely, though you may experience a bit of crashing since you are still starting. Design-wise, this quad has been designed and created with beautiful craft. Trust us; you will surely like the sophisticated as well as smooth flowing aesthetics and design of this drone. When it comes to the colors, there are lots of options where you can choose from. The color painting is of extremely high-quality and brilliant. Nevertheless, this device provokes an all-around good-looking display texture. Another thing that you will surely notice about this quad aside from the size is the collection of vibrant colors which they come in. In addition to that, each quad comes in a similarly colored transmitter giving you a more colorful drone flying experience. In this section of Cheerson CX-10 review we are going to discuss everybody’s favorite topic no other than the drone’s flight time. As what we said a while ago, the Cheerson CX-10 gets a decent flight time of approximately four minutes. Either way, it is only an average. By flying the drone conventionally, you may extend the flight time by one to two minutes. The drone, on the other hand, utilizes a Lithium-ion (Li-on) battery (3.7v 100mAh) which takes less than half an hour to charge. To charge the battery, you will need to use a USB cable charger which is included in the box. However, when the battery is still charging the cable will light up, and when the drone is completely charge, the light will automatically go off. Either way, if you’re worried about the drone’s short flight time, you may want to consider buying more CX-10s. In spite of everything, this device is budget-friendly. As a reminder, make sure to utilize the charger that comes with this item all the time. Do not use an ordinary wall charger for tablets as well as smartphones since they're likely to damage your drone's Li-ion batteries. In addition to that, when charging make sure to check it frequently and once it completely charged unplug it immediately. Don't worry, determining that it is wholly charged is very simple. Aforementioned, when the light on the cable goes off, it is an indication that you need to unplug your drone. The built-in LED lighting is one of the most essential features of Cheerson CX-10. Each motor of this drone has an LED light mounted. This drone comes with two blue LED lights which are located at the back and two red LED lights in front. Undeniably, the built-in LED lights always come in handy most especially when you are flying at night or in dark areas. On the other hand, such lights can provide you with a quick positioning of the quad when you're flying at a very high speed. Also, the inbuilt LED lights offer a colorful as well as a nice effect when you're operating in low lighting or at night making your flying experience fun. In the community of drones, the term “yaw rate” is commonly utilized to define how fast a quad can rotate either counterclockwise and clockwise. Either way, the Cheerson CX-10 has a high-speed yaw rate. Though we cannot provide you with an exact number, we can say for sure that this drone is faster compared to other models such as the UDI U818A as well as the Syma X5C. A faster yaw rate, on the other hand, can make drone flying more fun. Thus it is an additional advantage for the CX-10. Nevertheless, if you are currently looking for a model that has an even faster rate, then the Hubsan X4 H107L is something worth getting. Here is a fun fact about this drone from Cheerson: the transmitter or controller is bigger than the size of the drone. Either way, the transmitter sports an intuitive and straightforward design, It comes with an on/and off button, two joysticks that can be utilized for controlling the quad, as well as sensitivity adjustors which are useful in making the controller either less or more sensitive. On the other hand, to activate the Cheerson CX-10, you need to move the controller in a down, up & down sequence. However, the said sequence should be performed every time you're powering on the quad. Nevertheless, the transmitter doesn’t only provide a very smooth functionally, in fact, it is also ergonomically and beautifully designed. Apart from that, it is simple to operate and comfortably fits in the palms. As what we said a while ago, the Cheerson CX-10 is powered using two triple-A batteries, and you have to buy them separately since they are not included in the package. However, the controller isn’t as rough as expensive models. With that said avoid dropping as it’s quite fragile. Furthermore, it's a 2.4GHz RC that has an excellent diffraction ability. You can utilize it to apply more extended range mechanism of the quad. Even so, it has an operative control range of 20 meters to 50 meters. Moreover, it features a decent frequency bouncing, and you might utilize it to apply control through the quad even if your device is flying around hindrances. Nonetheless, we do not have any problem when it comes to the quads controller or transmitter. However, we have heard some protests about being too tiny. So if you have bigger hands, it could be a big problem. When you're using the transmitter, you need to be wary about dropping it. While the Cheerson CX-10 might undoubtedly take a beating, sad to say the controller can't. Keep in mind that the transmitter is just made of cheap plastic material, which is quite reasonable coming from a quad this inexpensive. The manufacturer of this drone doesn't provide a pledge of guarantee for this small drone. Either way, some online sellers offer up to 90 days warranty for this quadcopter. However, the sad reality about these warranties is that the guarantee does not pledge a cover for the drone's physical damage. In simple words, the service warranty offered by these sellers doesn’t cover breakages or damages. With that said it’s clear that this quad does not have a valid warranty. Nevertheless, it is acceptable as well as possible to request a replacement or free repair in case the product arrives in a broken condition or incomplete. Whether you are an advanced, intermediate, or advanced flyer, the Cheerson CX-10 will surely stick to your flying style without a glitch. Why? Just because the Cheerson CX-10 comes with three various flight modes. Depending on the level of your flying experience, you will be able to adjust the Cheerson CX-10 to your desired mode. The flight modes, on the other hand, include the advanced mode, beginner mode, and intermediate mode. If you are a more experienced flyer, then the advanced mode is suitable for you. This mode will allow you to fly your drone at much faster speeds. On the other hand, the advanced mode is quite sensitive. Thus it's not ideal for beginner flyers and for those who are not yet comfortable with controls. If you prefer a flight mode that has the least maneuverability as well as the lowest sensitivity, then the beginner mode is right for you. The main advantage of this mode is that it can offer you adequate space to comfortably fly your quad without of unrestrained movements which are likely to crash your device. However, if you're learning it is best for you to begin with the beginner mode. Nevertheless, always keep in mind that the Advanced mode will drain your drone's battery more rapidly. For extra defense during landing, the Cheerson CX-10 might be tailored with prop guards. This will lessen the costs of having to replace the propellers because of damage regularly. However, the propeller guards are not included in the package. Meaning to say, you need to purchase them separately especially if you want to protect your quadcopter. If you’re a new flyer, it is highly suggested to equip your CX-10 with propeller guards it makes sure durability since you’re likely to use your quadcopter into hurdles a couple of times that will shorten its lifespan. On the other hand, fitting the propeller guards adds weight on your quad resulting to shorter flight time. Also, it is highly recommended to purchase spare props just in case your current propellers might damage. Nevertheless, the propeller guards can offer you enough protection; however, if your crash your device often, there is no doubt, the props will be damaged. Unlike other models, this quadcopter doesn’t come equipped with a camera. Cheerson, on the other hand, intended to make a mini quadcopter which can be purely utilized for fun. Regarding the design, there is no doubt; this quad is a work of art. It looks like a typical quadcopter that has anatomy that is cross-like with props hinged at the ends. On the other hand, its three pieces landing gear completed the drone's design. The whole drone (the battery is fully fitter) weighs 3.2 ounces and has a total dimension of 3” by 3.1” by 3”. Irrespective of its lightweight, this quadcopter is extremely stable making it a great toy/device for fun. Moreover, the entire body of this drone is made of somewhat durable plastic material which is capable of sustaining minimal crashes. On the other hand, if it creates several crashes most especially on rough terrains, this quad is likely to damage and break with ease. With that said, it’s highly suggested to make use of this quad indoors. One factor that you need to keep in mind regarding this drone is that it is hugely faulted tolerant, so it is not an extremely fragile device. In addition to that, it doesn't forgive flying accidents and even mistakes. After all, this drone is relatively cheap, thus what can you expect. 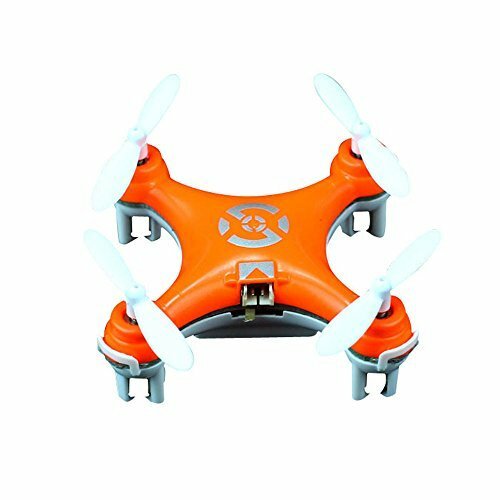 Since it is ideal for beginners, using this drone is very easy. When it comes to the setup process, you don't have to use any tools like a screwdriver just because it is ready to fly or RTF model. All you have to do is make sure that its batteries are fully charged before inserting it to the quad. After which, you need to follow the given instructions that are included in the box. This drone must be powered on a surface that’s level and flat at the same time. However, when you are powering on the transmitter, make sure to check if the controller’s left-hand stick is at the lowermost or down. Nonetheless, once the CX-10 and the transmitter are turned move the control stick (left hand) fully up and down. That action will activate different beeping sounds. Once you've completed the movements for the left stick, the four LED lights on your drone should be producing a stable light flash rather than blinking. 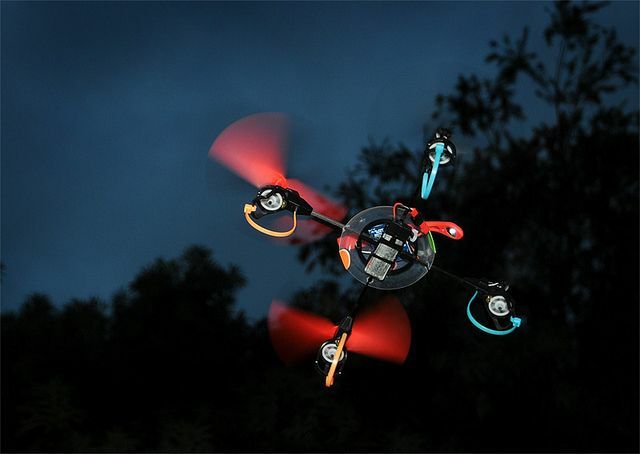 Thus, if the light is continuously flashing, your CX-10 quadcopter is all set for the takeoff. Almost all the drones are constructed with the back end as well as front part. As what we mentioned a while ago, the CX-10'front end features two blue LED lights whereas the back end has two red LED lightings. The switch button, on the other hand, is located on the rear part of the drone. By using the control stick (right hand), you can quickly move this drone in a backward, left, or right position. Also, you may control the throttle (up and down directions) using the left-hand stick which is located on the transmitter controls. Such controls perform the yaw movement for maneuvering the drone through rotations. The Cheerson CX-10 doesn't feature a headless mode which is quite popular in other models. With that said, you should always make sure that you're facing the route of the quadcopter's forward since the movements will be coming from the perspective of the drone. This will let you track of your drone forward and backward. On the other hand, the blue LED, indicating the drone forward, should assist you in the right direction that you need to face. However, this might be restricting especially when you’re performing yaw movements. Nevertheless, the CX-10 quadcopter has a small control range of 20 meters to 50 meters. The throttle of this drone is extremely sensitive, mainly when flying in the advanced mode. That is why, if you're not yet familiar with the controls, make sure to touch them gently to maintain the quad's control. Beginner flyers should fly their drone in the beginner mode. When you mastered flying, eventually you can move on to the intermediate mode and afterward the advanced mode. As a reminder, when you’re losing control make sure to lower down the throttle to turn off the power on every motor. In extreme conditions, it is best to let your drone crash than allowing it to fly to the distance and may get lost. If you're feeling assured enough about controlling the controls, there is no doubt; you will be able to start performing flips simply pushing the right-hand stick in the transmitter. Make sure to push it as if you are pushing a button. Your quad will produce a beeping sound that is an indication that it's all serf to execute some flips. As a final point, make sure to push the stick (right hand) in any directions (back, forward, right, or left) so that you will be able to make the small drone to flip in that particular direction. On the other hand, when flipping the drone, make sure you’re at a harmless distance because there is a chance that your device will crash when you move sharply and loses altitude all of a sudden. Recalibrating the gyro is sometimes needed most especially when some of the blades are rotating at slower speeds than the others. Even so, the gyro can be calibrated either manually or automatically. To calibrate it manually, you need to turn off the drone and then position it on a level and flat surface and after which, switch it on. Take note, before flying your quad you have to wait for a couple of seconds. When the drone is turned on you can calibrate it manually. All you have to do is place your device on a flat as well as level surface, then move the control stick (left hand) towards the lowest left after which move the control stick (right hand) on the controller's upper left angle. In this position, hold the two control sticks for a few seconds. The lights of the drone should start blinking fast; then the quadcopter will be calibrated. -Comes with four additional blades that always come in handy after damaging because of crashes. -It can be pocketed comfortably. Determining which part is the front and back when flying is quite tricky because of its small size. If the batteries get low, the LED lights blink which makes drone flying difficult. The fast sped of this drone can demonstrate to be disastrous when utilized indoors, making it prone to severe crashes. -If tilted too much, this drone will collapse. -Users with bigger hands can’t utilize it comfortably. -It faces some connectivity problems even if you are flying in an active control space. The Cheerson CX-10 is a nano drone that offers mind-blowing performances. Its affordable price is simply matchless. If you are only starting on your quad hobby, then purchasing this quad from Cheerson is a great idea. Moreover, if you think you're skilled enough to fly a higher-end and more expensive model, then you may want to upgrade your current drone. When it comes to the controller or transmitter, there's no doubt it's excellent. This product offers every flyer three different flight modes, the advanced mode, beginner mode, and intermediate mode. With this feature, you will be able to choose the right mode that suits your flight preferences and level of experience. In addition to that, changing the mode is very easy, and it doesn't require an advanced level of flying experience. Cheerson, list a excellent range of 50 meters, though some flyers have testified flying this drone away from the specified range. However, it would help if you kept your eyes open since the link of the transmitter is expected to be damaged particularly when the drone goes over the range, and you'll have to reactivate your device to connect the link again. If the quad is flying horizontally and out of the range, it will drop on the ground. The CX-10 quadcopter has a flight time of 4 -5 minutes which is acceptable for a quad of its category. Since it's very affordable, this drone will only allow you to fly in just a short period. Fortunately, it has a fast charging time of less than half an hour. Despite its elegant construction, this quad is a bit rugged. It may take a decent beating before it's damaged. Flyers may crash it for a couple of times, but this device will remain running. If you are currently on the market for an impressive as well as a very affordable drone for beginners, then the Cheerson CX-10 could be a significant investment. This drone has almost all the fundamental functions that may aid you in enhancing your skills as well as performs very well. The good thing about this affordable quad is that you can utilize it for consistent drone flying and performing some aggressive turns and flips at the same time. Nevertheless, this drone is also ideal for those who are looking for an affordable yet entry-level quadcopter. Also, we could recommend this quadcopter to be presented as a nice gift to a child or friend who is interested in drones. Hopefully, this Cheerson CX-10 review has helped you learn more about what this model has to offer. Thank you for reading and most importantly have a fun and safe flying experience.